PPC Broadband, Inc. has acquired the Nebraskan-based fiber provider, Net-Tech Technology (NT2) - a move that will add a range of innovative optical passives products to PPC's fiber business unit. "Broadband providers are driving fiber deeper into their networks, increasing speed and capacity to meet subscriber demand," says PPC President Dave Jackson. "The year-over-year spend continues to increase and we believe this trend will continue well into the future." NT2 was founded in 1994 and headquartered in Omaha, Nebraska. It offers specific expertise in fiber transport and network optimization, and has focused on the production of custom configured optical passives. The company has primarily operated in the cable TV and broadband space as a major provider of products to U.S.-based service providers. Paul Kaplan, PPC Vice President of Fiber Optic Business Development, says "NT2's growth has been fueled by responsiveness - with innovations that help solve problems, combined with the shortest lead times in the industry. "PPC/Belden shares our service culture and we look forward to building on this legacy as part of a company with extensive engineering, sales and support capabilities." The acquisition of NT2 significantly enhances PPC's existing product portfolio and provides a share in the headend and outside plant optical passives market - a range of devices, which Jackson describes as "necessary components" as the company expands its fiber product roadmap. "Specifically they help customers gain bandwidth in existing fibers using Dense Wavelength Division Multiplexing (DWDM) to insert more wavelength channels on a given fiber," Jackson says. 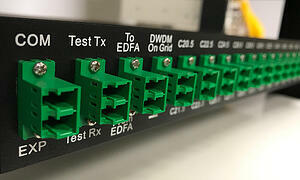 WDM technology uses multiplexers (muxes) to combine and transmit different wavelengths on a single fiber, allowing an increase in services without the need to lay additional fibers. WDM is simple to implement and enables higher speed and greater bandwidth than other technologies. BWDM is typically useful for multi-dwelling units (MDUs) where dense groupings of subscribers reside. A BWDM separates groupings of channels rather than single channels. CWDMs are an economical solution for short run, low density environments and ideal for areas of a network that don't have potential for future expansion. CWDM signals cannot be amplified and are typically suitable for distances less than 35 miles depending on signal throughput. DWDM offers the ability to accommodate more channels in a smaller band to maximize the capacity of fibers - enabling 40 channels at 100GHz spacing or 80 channels at 50GHz spacing. DWDM can be amplified for longer-distance transmissions, generally greater than 35 miles. OADMs act as "on and off ramps" for a single mode DWDM by adding bands of channels to a WDM signal or by removing and rerouting individual wavelengths to specific destinations as the signals continue down the trunk. Splitting allows operators to spread the cost of expensive optical components such as transmitters among a larger number of subscribers. Planar Light Circuit (PLC) splitters provide low loss and are suited to larger, more complex networks. Multiple-fiber push-on/pull-off (MTO/MTP) splitters are high-density splitters best suited to fiber deep applications, offering space efficiency and simplicity of installation and fiber routing. PPC and NT2 are excited to work together to provide a more robust fiber solution for its customers around the world. If you are interested in learning more about these products, please contact our customer service team at +1 800 800 6652 or customerservice@ppc-online.com.